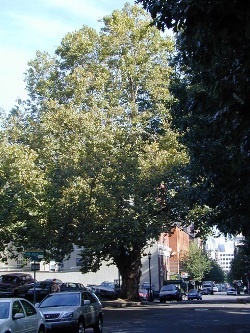 The first Heritage Tree. 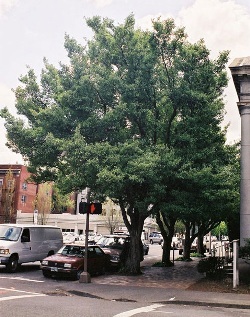 "This tree was brought to Portland, by ship, around Cape Horn at the tip of South America! It was planted here in 1870 by Martin S. and Rosa Frazar Burrell in their front yard. He was a partner in the largest seller of farm equipment, and she was a civic activist instrumental in founding the Unitarian Church. 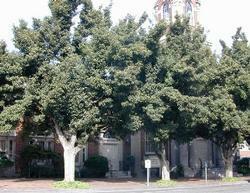 It is, to this day, known at The Burrell Elm, " Phyllis Reynolds via Trees of Greater Portland. Read more from Paul Gerald. 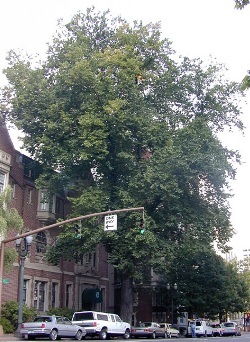 This tree was planted in front of the home of Martin and Rosetta Burrell in 1870 and is thus known as the 'Burrell Elm'.